If, like me, you are fortunate enough to have access to some ahimsa milk from cows that are happily grazing outside, then this milk makes the absolute best yoghurt. However, any good quality organic milk will do quite a good job. 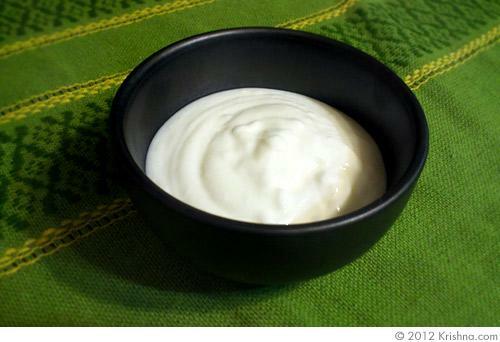 You do need to buy some yoghurt or some yoghurt cultures in order to make yoghurt at home. I usually purchase a little pot of good quality, organic plain yoghurt which is readily available at shops nearby. You can take the short cut and purchase a yoghurt maker, which controls all of the temperatures and timing, but it isn’t necessary. I prefer this simpler method, rather than have yet another electrical device taking up space in my kitchen. 1. Pour the milk into a thick bottomed saucepan. Heat over medium heat, stirring frequently to prevent sticking. It may seem to take a while, but heating it too quickly increases the chance of burning all of your lovely milk. 2. When milk boils turn off the heat and remove from stove. Using your thermometer allow the milk to cool to 110 F.
3. Only when it reaches the ideal temperature, add the yoghurt and stir to mix well and cover. Place the mixture in a warm place (at least 70 F) and leave for approximately 6 hours. 4. At this point the milk should have turned to yoghurt and can be placed in the refrigerator in a sealed container. *If your house is cold, you can heat your oven slightly and then place the milk in there to turn. *You could also wrap some towels around your milk container to keep it warm. *Be sure your milk is not colder or hotter than 110 F, or the resulting yoghurt will not be as nice in texture and taste. *I sometimes let my milk rest at a couple degrees hotter than 110 F if I know the yoghurt I am adding is coming just out of the refrigerator. Submitted by Anonymous on Fri, 02/10/2012 - 08:21. Another little tip thats always worked for me when making yogurt, is when I have no thermometer I put my pinky(clean hands of course) and if it can stand it for 10seconds I add the yogurt mix. I've been making yogurt since I was around 12 years old and that has never failed. Submitted by Pishima on Fri, 02/10/2012 - 13:13. Thanks for the tip. I am fairly new to the yoghurt making world but when I get braver or do not have access to a thermometer I will be sure to try the "clean pinky" tip :).